iGrand Piano is launching at the same time as IK's iRig Keys controller. Having recently announced the iRig Keys MIDI keyboard for iOS devices, IK Multimedia is now giving you something to play with it in the shape of the iGrand Piano. This, shockingly enough, is a sample-based grand piano app and gives you 17 instruments to work with. IK is claiming that the sound is on a par with the best of the Mac and PC software pianos: sampling took place at multiple velocities and you can adjust seven parameters for each instrument. There's also a built-in recorder that enables you to capture your performances and export options that allow you to share them. iGrand Piano costs £13/99$19.99/€15.99 and is available now on the Apple App Store. There's also a free version. IK Multimedia, the leader in mobile music-creation apps and accessories for iPhone, iPod touch and iPad, is pleased to announce the release of iGrand Piano, a concert-quality piano app for iPad that features 17 different world-class sampled pianos, available now on the App Store. iGrand Piano offers a virtual gallery of sampled pianos including grands, baby grands, uprights and specialty pianos such as a detuned saloon piano and a vintage gramophone piano. All the pianos were meticulously captured via high-definition sampling across multiple velocities, and offer true-stereo sound, extremely low latency, and a level of playability and expressiveness that's on par with the best sampled pianos on the Mac and Windows platforms. iGrand Piano is the premiere iPad piano app, unparalleled when it comes to sound quality and variety. Each of the 17 pianos can be adjusted via seven different real-time parameters including Volume, Ambience, Lid (positioning), Brightness, Transpose, Tuning and Release. These parameters can also be mapped to external MIDI controllers. iGrand Piano supports Virtual MIDI and MIDI program change. IK Multimedia offers two excellent options for playing and controlling the instruments in iGrand Piano, including iRig® KEYS, a portable 3-octave MIDI controller for iOS and Mac/PC; and iRig® MIDI, its CoreMIDI interface for iPhone, iPod touch, and iPad. 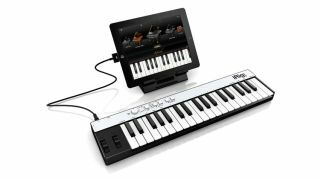 Also, registered owners of iRig KEYS or iRig MIDI get to unlock an additional bonus piano inside iGrand Piano instantly. In addition to its world-class sounds, iGrand Piano provides an onboard recorder with overdubbing, punch-in, quantize and a large visual metronome with a tap tempo feature. Recordings can be exported as WAV or m4a audio files using file sharing, e-mail and copy function. For onscreen playing, the app features two keyboard views: one zoomed out, showing the entire 88-keys; and one zoomed-in, showing a 2-octave keyboard with larger keys, which slides to cover different ranges. The iGrand Piano is available for $19.99/€15.99 from the App Store on iPad or at www.itunes.com/appstore. Purchasers of iGrand Piano get a selection of eight top-quality pianos (including one that's unlocked after registering the app), and can add the other nine through a Piano Expansion Pack available via In-App Purchase. A free version of iGrand Piano is also available, featuring one high-quality grand piano sound, and users have the option to add more pianos to it later.